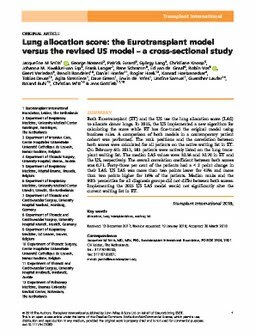 Both Eurotransplant (ET) and the US use the lung allocation score (LAS) to allocate donor lungs. In 2015, the US implemented a new algorithm for calculating the score while ET has fine-tuned the original model using business rules. A comparison of both models in a contemporary patient cohort was performed. The rank positions and the correlation between both scores were calculated for all patients on the active waiting list in ET. On February 6th 2017, 581 patients were actively listed on the lung transplant waiting list. The median LAS values were 32.56 and 32.70 in ET and the US, respectively. The overall correlation coefficient between both scores was 0.71. Forty-three per cent of the patients had a < 2 point change in their LAS. US LAS was more than two points lower for 41% and more than two points higher for 16% of the patients. Median ranks and the 90th percentiles for all diagnosis groups did not differ between both scores. Implementing the 2015 US LAS model would not significantly alter the current waiting list in ET.